Posted on Wednesday, December 11th, 2013 at 11:01 am by Pieter van der Westhuizen. 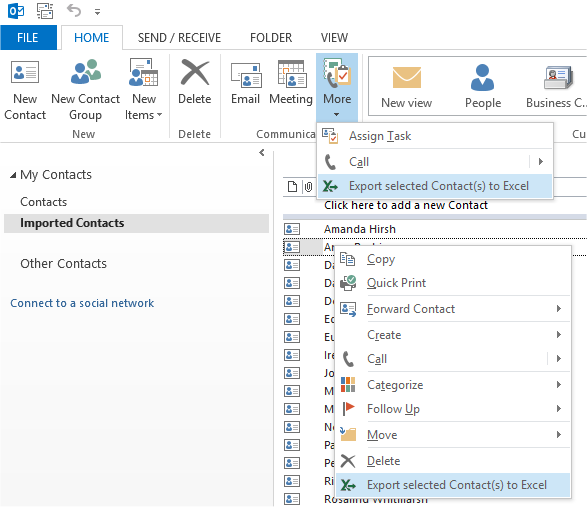 Importing contacts and appointments into Microsoft Outlook is a feature that has existed in Outlook for a while. 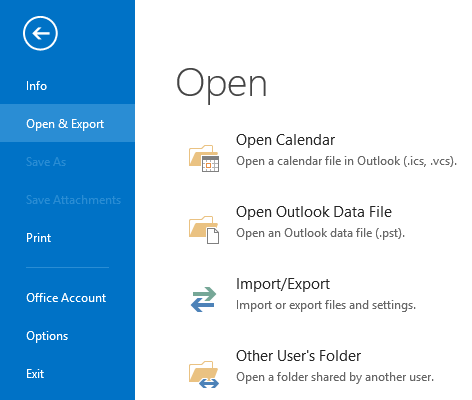 In Outlook 2013 you can find the Import/Export function in the File or Backstage view menu, under Open & Export. The standard Outlook import/export functionality takes you through a series of forms and even allows you specify field mappings. 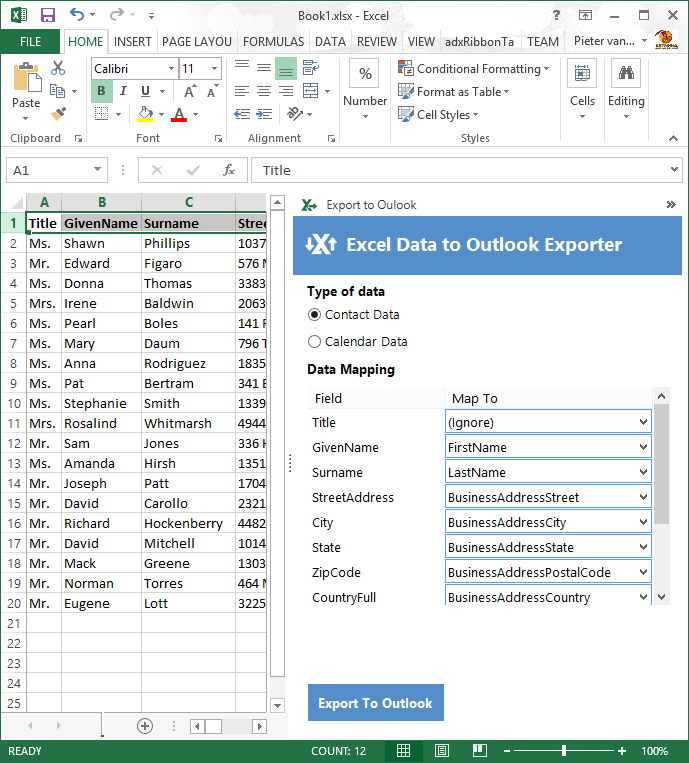 Now, the standard functionality is fine, but let’s try and make it even easier for our customers to import and export data either from Excel to Outlook or from Outlook to Excel by writing our own shared Excel and Outlook add-in. 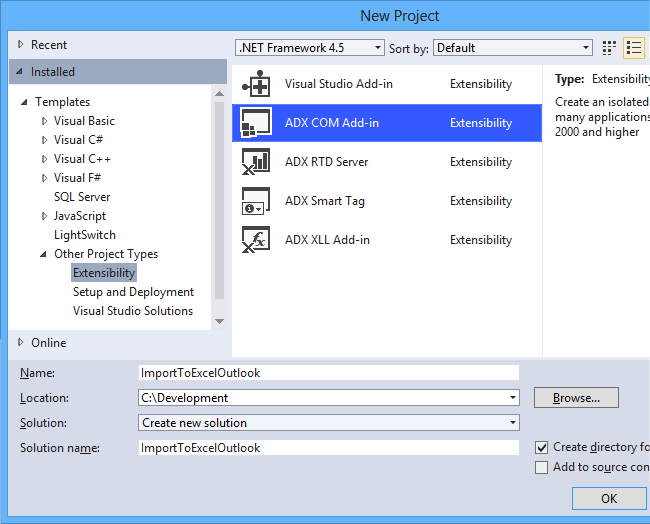 Start by creating a new COM Add-in project for Outlook and Excel in Visual Studio. Next, select your programming language of choice (C#, VB.NET or C++.NET) and the minimum version of Office that will be supported by your add-in and finally select both Microsoft Excel and Microsoft Outlook as the supported applications. We’ll add an advanced Excel task pane, which will have our main UI for the add-in. 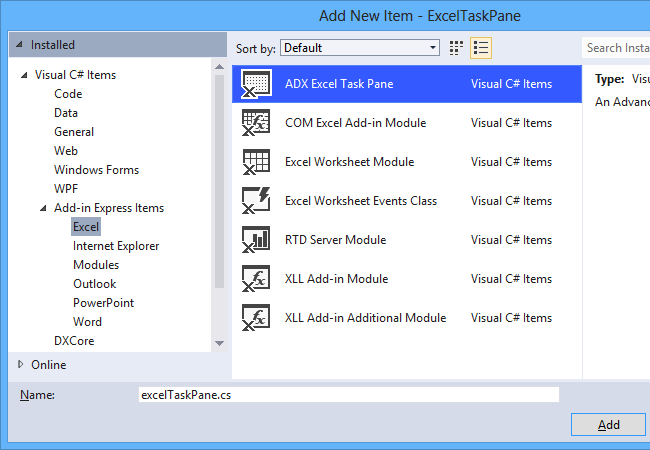 Start by adding an ADXExcelTaskPaneManager component to the AddinModule designer surface. We’ll design the new custom task pane as we would any standard Windows form. The following task pane consists of two radio buttons: (i) a DataGrid view control and a button; as well as (ii) a panel and a number of label controls. I’ve also added a DataSet to the form, which contains one DataTable with three DataColumns. The above code, shows the built-in Outlook Folder Selection dialog by calling the PickFolder method of the Outlook.NameSpace object. 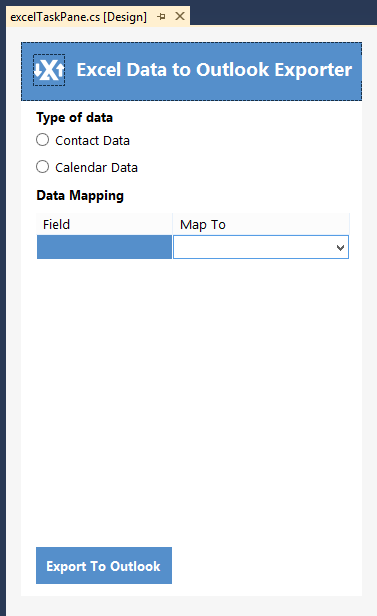 It then checks whether we’re exporting Contact or Appointment data, and then creates either a new Outlook.ContactItem or Outlook.AppointmentItem object and loops through the rows in the sheet. 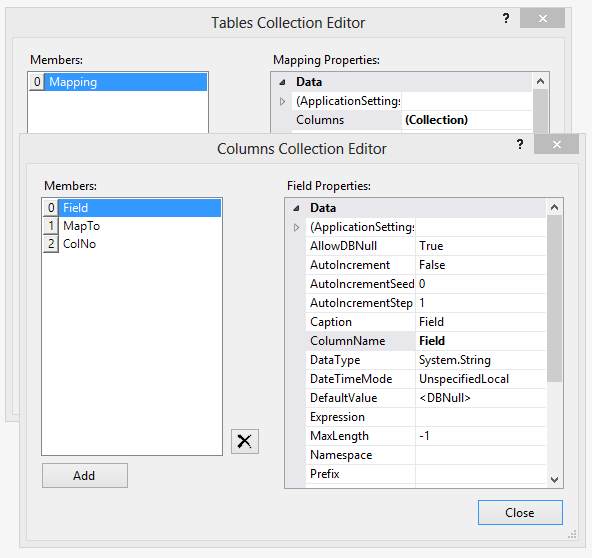 It uses the mappings stored in the DataTable to know which column values to set to which Outlook object properties. On the reverse side we would like to export Outlook data to Excel. Our UI in Outlook will be far simpler than our Excel UI as we’ll only add an item to the Contact context-menu in the Outlook Explorer. 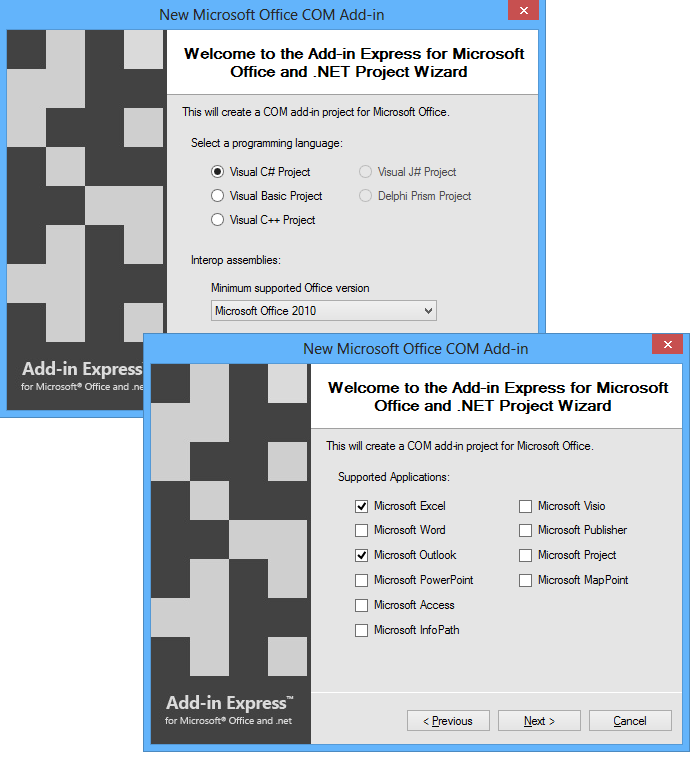 Start by adding new ADXRibbonContextMenu item to the AddinModule design surface. 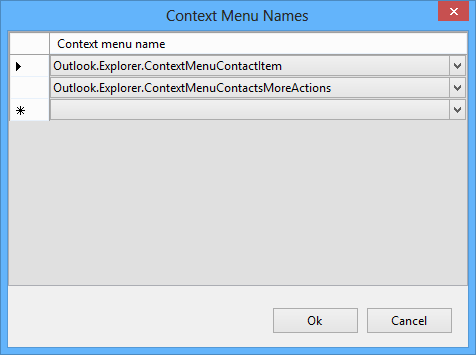 This will cause the menu item to be displayed on the context-menu of an Outlook contact item as well as in the “More Actions” list in the Communicate Ribbon group. Dear Sir, I’m not a programmer, but I’m looking at your convertor Excel to Outlook. Is it possible to do the same with an Excel 2016 task list to import it into Outlook 2016 Tasks? I have an Excel file with 600 periodic inspection tasks to be done (monthly, yearly, bi-yearly, etc.. Is this possible with your macro’s? The above is an add-in, not macro. Anyway, it can’t be used to achieve your goal. I suggest that you find a programmer who is able to write an add-in or VBA macro for you. Discuss the requirements with the programmer and choose the route to take.